The Air Side Chair in Red leatherette. A minimalist design made by Bellini Modern. The metal frame is ergonomically shaped for comfort and durability. This sleek design, showcasing wonderful tailoring and exposed brushed metal legs, is available in multiple colors and is in stock ready for fast delivery. Available in Red, White, Gray, Black. Must be ordered in sets of two. 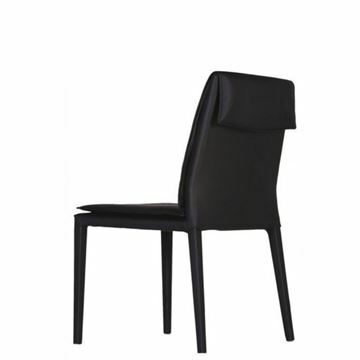 Bellini Modern Daisy Side Chair, shown in black leatherette. 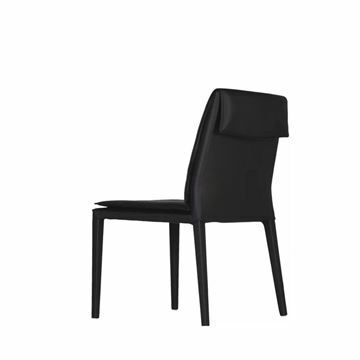 The Daisy is a clean profile and very plush sitting design, with wonderful functionality. Created with two removable parts: seat and backrest. You can detach the cushions for easy clean up. Legs are also upholstered in the same matching cover. 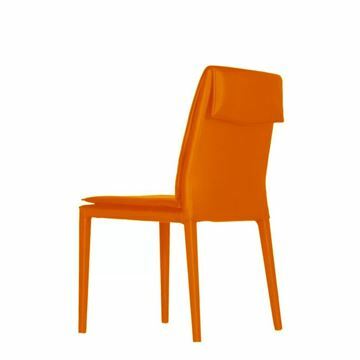 Bellini Modern Daisy Side Chair, shown in orange leatherette. The Daisy is a clean profile and very plush sitting design, with wonderful functionality. Created with two removable parts: seat and backrest. You can detach the cushions for easy clean up. Legs are also upholstered in the same matching cover. Bellini Modern Daisy Side Chair, shown in brown leatherette. The Daisy is a clean profile and very plush sitting design, with wonderful functionality. Created with two removable parts: seat and backrest. You can detach the cushions for easy clean up. Legs are also upholstered in the same matching cover. Bellini Modern Daisy Side Chair, shown in white leatherette. The Daisy is a clean profile and very plush sitting design, with wonderful functionality. Created with two removable parts: seat and backrest. You can detach the cushions for easy clean up. Legs are also upholstered in the same matching cover. Bellini Modern Daisy Side Chair, shown in gray leatherette. The Daisy is a clean profile and very plush sitting design, with wonderful functionality. Created with two removable parts: seat and backrest. You can detach the cushions for easy clean up. Legs are also upholstered in the same matching cover. Bellini Modern Daisy Side Chair, shown in red leatherette. The Daisy is a clean profile and very plush sitting design, with wonderful functionality. Created with two removable parts: seat and backrest. You can detach the cushions for easy clean up. Legs are also upholstered in the same matching cover.